Tailoring Alterations Of What, When And By Whom? Tailoring alterations, in sewing, just what do we mean by the term? One online dictionary refers to the term as a modification, change or adjustment that we do to something, particularly to a garment. At some point in our lives as either sewers or shoppers, tailoring alterations may be needed. Whether it is a garment that we have purchased or one that we sewed from a pattern, there are reasons that we may need to alter garments. Fitting is the up front process that we used to create the perfect garment when we first sewed it from a pattern, but now the garment may no longer, for whatever reason be so perfect! Well, if we aren’t ready to give it away and don’t want to throw it away or even break the garment down into pieces that we can use in a new sewing project, we can alter the garment that we so lovingly created to make it fit once again. Why would we need to alter a garment? Well, maybe we or some other member of our family or others we may sew for has gained weight or even lost weight, or maybe the garment simply needs some updating to make it look more modern or maybe we have growing children and we want to alter a perfectly good garment once worn by one child to fit another, after all it is a perfectly good garment that we lovingly sewed ourselves. So, instead of trashing the garment if we want to continue using it as opposed to discarding it and we aren’t ready to donate the garment to charity yet, then we can alter the garment. Neither do these actions only apply to clothing that is now too small or too loose. The term also applies to such activities as mending tears, sewing on buttons that have come off, repairing or replacing a zipper, repairing a hem on a garment that has come loose or even shortening a garment. Why not just take the garment to a seamstress or tailor you might ask? I keep hearing from many people that I know that having a garment professionally modified or repaired can be expensive, and these same folks say that they are always looking for someone to do it cheaper for them. Well, why not learn to make changes to garments yourself if you have the time and interest? Admittedly garment modification and repair is time consuming and must be done with precision, but it is something that we can learn ourselves. 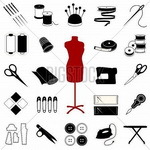 There are some basic tools that are needed to get started and most of us that sew have these. These are a sewing machine, a serger, scissors, sewing machine needles, a seam ripper, tailor’s pencils and tailor’s chalk, garment pins and a measuring tape. The right tools prevent further damage to the garment, so these tools are basically a must! There are two types of modifications that deserve their own discussion, these are pattern tailoring alterations which as mentioned are the upfront modifications for a newly created garment and clothing alterations which are changes that may be needed after the garment has been put to use. Modifying patterns actually goes hand in hand with pattern fittings. Just click on the link for pattern tailoring alterations and the link to clothing alterations for a discussion of what is involved in each.